This was another 3-elk year. Friend Ken killed a bull and a cow early in the season, while we were away in California. The bull had been severely injured in a fight and would not have lasted through the winter. He also got a deer on the last day of the season. 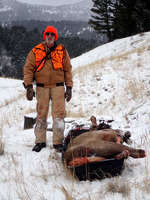 Toward the end of the season cousin Francis came from Kansas to try his hand at elk hunting and Ken agreed to help him out. A week of sunrise forays produced a few sightings of lone elk but no legal or safe shots. Finally, over 200 elk appeared below the Main House near sunset. It was too late in the day to shoot (we did not want to be dealing with a dead elk in the dark at 0°F). Next morning, the elk herd was no longer below the house but Francis got his choice of 200 elk one hundred yards above the house. He picked a nice, fat cow and killed her with one well-placed shot. We got a small share of each elk; we have not finished all the meat from last year, so our freezer is full! The seeds for this hunt were planted by Gary's cousin Wanda Jo (Gary's mother's namesake). 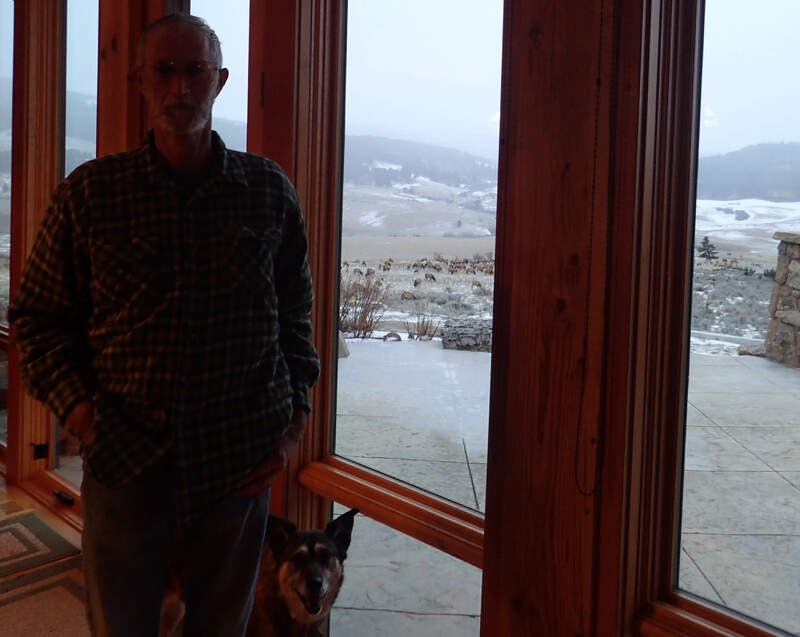 She applied for a permit on husband Francis's behalf after she saw how herds of elk liked to hang around our property. Wanda Jo died unexpectedly before the permit was granted; we all said a word of thanks over the elk in her memory. 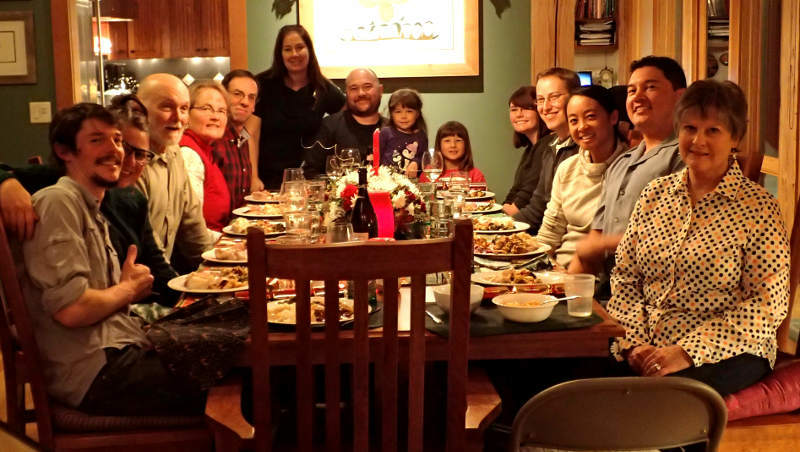 This Christmas we will be hosting 4 of the 5 children plus their spouses or girlfriends and the two grandchildren. That calls for a Big Christmas Tree. We hiked out the front door with our pruning saw and found a nice tree about one hundred yards uphill to the northeast (near where Francis got his elk). In a moment of genius, it occurred to us we could employ the game sled used to retrieve Francis's elk to transport the tree back home. Of course, the tree did not fit in the sled, but it did help with the heavy end. 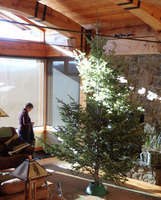 This tree appears to be the tallest we have cut since moving into the Main House in 2007 – for reference, the steel rods connecting the ends of the arched timbers are exactly 10 feet from the floor and the top of the timbers above the fireplace is 12 feet. We had to cut about 6 inches from the top of the tree to accomodate the crowning ornament, but it is still over 11 feet top to bottom. Even with our 10-foot ladder, decorating the top was a challenge because the lower branches prevented us from placing the ladder close to the tree. From the left: Arthur, Alixandra, Gary, Terri, Dennis, Samantha, Marcus, Allison, Lauren, Kendal, Brandon, Xue, Paul, Pauline. Missing are Dan and Kristina, who spent Christmas with family in Wisconsin. They plan to visit us later this Winter. A woman said she found a listening device in her house and she thought she knew who put it there. Officers found that the device was a lightning surge protector. That's just what the cable company wants you to believe. A bear decided to check out the High School. In case you are wondering, Bozeman High School is located on Main Street, not far from the center of town. A caller reported that a dog was left in a truck overnight. Upon investigation, it was determined that the dog's owner was also sleeping in the vehicle. A caller wanted to report that a tip jar at a business on Main Street was labeled “For dabs 420” and had a lot of money in it. Had to look this one up. Apparently the caller knew what it meant, which makes them immediately suspect. A woman called police to report hearing a bell ringing in her house. An officer arrived and was escorted to the area of the suspicious bell ringing. The woman was informed the noise was from the debate bell, which was on her TV. Apparently the candidates could not hear the bell, though.